Find the right mix of high volume and great original content – it’s key to your article marketing success! Experience tells us that if you write and submit a quantity of high-quality articles, you’ll generate more traffic back to your site. 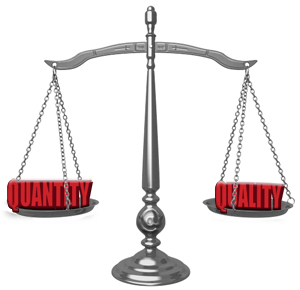 The trick for most Expert Authors is finding that perfect balance between the “quantity” part and the “quality” part. Improving the “quality” isn’t so simple. Ironically, the best way to improve the quality of your writing is to write – which takes time. In lieu of that, educate yourself not only in your area of expertise but also on the art of writing articles. The EzineArticles blog is a great resource for discovering new tips and techniques. Bottom line: If your articles are good, readers will find you. If they’re not, no sheer number of articles will ever make up for that. Now go write your next set of articles with this thought in mind: Always balance quantity with quality. OMG.. Yes, this is my agenda now, balancing the two efforts. I want to go back at this point and perfect past articles for one. Keywords are so essential, but in my effort to create 100 articles in 100 days I put the ‘quality’ of my keywords aside. I just wrote! Problem is of course my reads for all that effort is minimal compared to when quality keywords, used tastefully, were in the forefront. The difference was/is gigantic. Also, what I write is who I am essentially. I am putting my vision, and commentary of my ideas and ideals essentially. I have people who write to me telling me that they follow my work. Wow! I have to wonder how long they will do that, if I don’t put a conscientious effort towards saying something meaningful with a quality effort. With the right mindset you can get a lot of quality articles done. I think one of the biggest problems most people have is they either have too many ideas or too few. In the first case they try to stuff 10 different topics into one single article believing that such an article has high value or quality. But the opposite is true. It’s almost unreadable because you don’t know what the writer is trying to tell you. An article should only teach one single thing. Ask yourself what is the one single thing you want to tell the reader and write about that in detail. This way you can produce higher quality articles much faster and easier. I have noticed that since I have started commenting on blog my article writing has improved. So, I always gave him what he wanted – all of my ‘other’ writing went in the “circular file” (trash). It is your obligation to do the same for your “BOSS” (i.e: all who read what you write from now on). How do you learn to write your best? Think then write! (Not the other way around). Great post and is a lesson that I was able to learn within the past few weeks. Finally I was able to find the right number of articles to do on daily basis without hurting the quality in which I wrote each of those articles. I have weeks when I can come up with lots of ideas for article writing. Other times I come up with nothing. Personally I don`t think it`s worth `forcing` myself to write, as though I must do so many articles over a certain period of time. I`m more satisfied when I do it at my own pace, and as the original post said, getting the balance between quality and quanity right. I agree with Geoff above. I don’t think there is much to be gained from forcing yourself to write about a specific topic or around a particular keyword. My experience is that if I try and make myself write an article I have little enthusiasm for then I produce utter trash. Far better to find something inspiring. I suggest you write a bunch of headlines (on paper, not in your head). Then, before you go to bed that night, say a prayer and ask the Lord to help you with the problem. Then go to sleep and your subconscious mind can find the solution while you sleep. When I do this, I often awake in the morning with the ideas needed (solutions) and can easily write them down on paper as a steady clear, easy to read, flow of words and ideas. Don’t take my word for it…Try it for yourself! Thank you, an idea worth trying. As you mention the word “problem”, thinking up a list of problems a person may have within your niche may also bring results. The Lord, our Creator made us in His image. Therefore it is in our genes, our personalities, to just naturally be a creative people. Creativity is within you – you just need to have what it takes to dig down and search for it – like digging for gold. Another excellent point. What good is a bunch of content if it isn’t high quality stuff? Likewise, what good is a great blog if it doesn’t have enough content. How about adding this suggestion for improving your article quality: Check your article for grammar, punctuation and spelling. I try to post nice comments on some other authors’ articles a couple of times a week, but some of them are published with so many grammar, punctuation and spelling errors, I don’t even want to read past the first paragraph. Not that I haven’t let a few slip in my own articles, but I go back and edit them. I also have other people proof my articles, both to catch errors and to be sure that they make sense. I think we should all write as if we were face-to-face talking with one other person (Exception: Technical writing). Put smiles and questions into your written conversations. Did you know that the early bird gets the worm, but the second mouse gets the cheese? In my opinion, there is room for many writing styles, but not for sloppy writing. I read an article on EzineArticles yesterday that I wouldn’t allow a middle school student submit as a final draft. If nothing else, your name and your profile are on EzineArticles, connected with your writing. The whole world can see your great writing – or your sloppy writing. Bear in mind that for a sizable percentage of our authors English is not their native language. For them, the intricacies of spelling and grammar are all that more challenging. And of course – write, write, write! I have found that it helps establish a writing habit, and no one else ever needs to see any of it, until I have found whatever there may be of value in what I have written, and polished it to the best of my ability. So, sometimes, Write, then think! Sounds like that sequence works for you, so go for it. I can see how it could help overcome inertia. (“a body in motion…a body at rest…etc”.) I just prefer to do it the other way around that is: Think first, write later. This is my first visit to this blog and I’m glad I stopped by. The above article is very interesting and very helpful. My style of writing articles, or any kind of writing, is to start writing as soon as I sit down. I’m always prepared to change the first paragraph, but most of the time I only do a few small changes. I find that staring at a blank page just doesn’t work. 3) Try to push your article up the search results if you think you’ve delivered quality. I believe I have done this fairly well with my latest article. And the reward is close to 600 visitors and 200 URL clicks in just one and a half day. This may not be very big I guess, but it made me realize the weight quality commands. Thank you for the short – yet informative – article balancing quality with quantity. The points are well worth pondering. Congratulations, Alevoor Rajagopal! And, thanks for putting a word in for quality!!! Write on! If I have lots of topics in my head and want to crank out faster articles, I write the ideas/topics out on a white board I have that sits behind my desk and then mind map each topic with a few words for each subtopics. I log in my EzineArticles account and start typing within ‘article body’ section so I can have them on file to edit or clean it up and submit the articles right there and then. I’ll have create the title and keywords last based on the article body. I totally agree. I have found that the more you write the better you get at forming your thoughts into words and communicating them in a way that is easily understood by the reader. The more you write the better you get at it. Thus, you end up with both quality and quantity the more effort you put into it; like anything. A few more words from me: I’m in my 82nd year now and I’ve been “learning to write” ever since I joined the USN when I was 17. Back then I was homesick (MY PROBLEM) so I wrote letters to: my family, and my girlfriends back home. Why? Because I wanted to get “mail” from them at the next Mail Call. (THE SOLUTION TO MY PROBLEM). Soon, I began to get mail – my shipmates were amazed at how much mail I got! Then, I answered the letters I got and asked everyone to please send me another letter (CALL TO ACTION). Many did what I asked them to do. Today, I still write in pretty much the same way: 1. Explain the problem. 2. Suggest a solution to the problem. 3. Call for action by the reader. I am learning so much from all these comments and am certainly going to integrate some into my next article. Can someone help with my first challenge though? I submitted my first article, a reply came back saying something needed to be fixed. It directed me to an email facility which I used and I have heard nothing. This was over a week ago. Obviously I have never done this before. What did I NOT do? Does anyone know? Thanks again for all the tips and advice.